This tile is one of four from the 'Elements' pattern no. 2175; Zephyria (sic), Terra, Ignis (shown in image.2)and Aqua.These were designed by Walter Crane for Maw & Co. Picture tiles (both printed and hand painted) appear to have been produced by Maw & Co. from about 1874 and the company used notable designers of the day, such as Walter Crane, Lewis Day and C. O. Murray, alongside their own in-house team. After C. H. Temple took over as senior resident designer at the factory, in 1887, the practice of using free-lance designers was reduced. The son of an artist, Walter Crane (1845-1915) was a leading figure in the Arts and Crafts movement best known for his paintings and illustrations for children's books.. He was celebrated for his subtle use of color and stylized forms. Crane was convinced that functional objects should be well designed and visually pleasing, and produced designs for wallpapers, textiles and ceramics. This tile demonstrates his interest in stylized forms drawing from both Classical subject matter and Asian inspired composition. 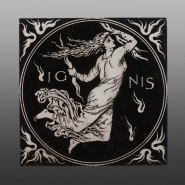 Tile of lead-glazed earthenware transfer-printed with a classical figure of Ignis, designed by Walter Crane, manufactured by Maw & Co., Shropshire, England, 1875-1885. Tile of lead-glazed earthenware transfer-printed with a classical figure of 'Zephyria', a girl within a circle. Her name is written across the tile. She holds a globe in one hand and a fan in the other. Her garments flutter in the breeze. In each corner is a winged head of a child blowing hard.